This is the story about how a chapter in Dorothy Colville's book, 'North Mymms Parish and People', helped three people in different parts of the world research their family histories back to North Mymms. The chapter tells the story of Rev.James Grantham Faithfull, vicar of St Mary’s, North Mymms 1844-1856, and his wife Frances (Fanny) Ruth Faithfull, 'The Pretty American', which was based on an original article Dorothy Colville wrote for the November 1967 edition of Hertfordshire Countryside. Both the chapter and a copy of the article are reproduced below. Below them is an article sent to this site by Mark Grantham, followed by two related feature from this site's history archive. Mark is a direct descendant of Valentine Grantham and Elizabeth Halse. Valentine's grandson, the Rev.James Faithfull (Vicar of St Mary’s North Mymms 1844-1856) was the son of Rev. Francis Joseph Faithfull the Rector of Hatfield 1819-1854. But first, chapter 24, 'The Pretty American' from Dorothy Colville's book. Born in Messina in January 1826, Frances Ruth Payson was the third child of a young American couple who had gone to live in Sicily after their marriage in December 1821. Her father, John Larkin Payson, six feet tall, dignified and courteous, traced his descent from Edward Payson, a young Puritan, of Nazeing, Essex, who had gone to the New World probably in the company of the famous Rev. John Eliot, "aposte to the Indians," not later than 1631. Her mother, Frances Lithgow, of Augusta, Maine, was of Scottish descent, a charming, cultured woman of attractive appearance and stately carriage, who when presented at the Neapolitan court was hailed as "La bella Americana." At the time of Fanny Ruth’s birth her father was engaged in shipping Sicilian products - lemons, sulphur and sponges - to Boston, and the following year he was appointed American consul to the Kingdom of the Two Sicilies, a position he held for eighteen years. The Paysons had a large family of thirteen children, which included three pairs of twins, but only Arthur, Fanny Ruth, Frank and Charles grew up. Early in 1844 as the family went to church there was some speculation as to who would be taking the service - they relied so much on visiting preachers. Seated demurely between her two young brothers waiting for the service to begin, pretty Fanny Ruth let her thoughts wander to the trip she and her mother would soon be taking. The service started. She glanced up and saw the preacher, a young man, English she guessed. Lord Cranborne, son of Lord Salisbury, of Hatfield, England, and his companion, the young preacher, were making the "grand tour." They had travelled in leisurely fashion through France and Italy and planned to return to England by way of the Danube. Naturally the young men paid their respects to the American consul and his lady, and as they had visited both North and South America a year or two earlier there was no lack of conversation. When, some few days later, Mrs. Payson and Fanny Ruth boarded the steamer for Athens the two young Englishmen were among the passengers. Fanny Ruth, after a whirlwind courtship among the beautiful Greek islands, came as a bride to North Mymms in the late summer of 1844. They were a handsome pair were James and Fanny Ruth Faithfull. She, so her husband declared, was one of the prettiest women he had ever seen; he had inherited the good looks of both his parents. His father, when a toddler, had been carried by George III to Queen Charlotte for her to admire. His mother, Mary Grantham, was one of the lovely girls from Scawby rectory in Lincolnshire, and the Grantham family was noted for its good looks. 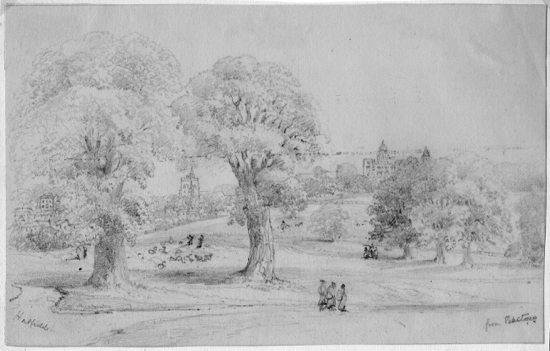 James and Fanny Ruth entered into the social life of the parish, visited Lady Greville at North Mymms Place, enjoyed musical evenings at Potterells, when Mr. Casamajor would play his ‘cello, and were always welcome at Brookmans, the home of Robert Gaussen, for James and he had been at school together. Hatfield was near enough for frequent visits, and Fanny Ruth soon grew to love her husband’s family, especially Cecilia, James’s favourite sister, but she was always a litte in awe of her serious father-in-law, Dr. Faithfull, the rector of Hatfield. James, like his father, was interested in education for the poor and was often in consultation with Miss Caroline Casamajor, who proposed building a school for girls in their nearest hamlet, Water End. Fanny Ruth sometimes walked across the field with James to see how the work was progressing. and when at last the little building was complete she was delighted with it. She took her drawing pad and sketched the school and Teakettle bridge against their background of trees. "How did the bridge get that quaint name?" asked Fanny Ruth, but no one could tell her. "It’s always been called that" they said. The little drawing took its place with the others she had already made. 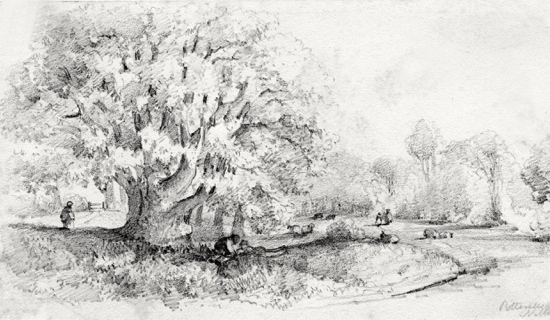 There were some of the church, one of that fine spreading tree in Potterells park (James said it was an oak tree), one or two of North Mymms Place and one of Muffets Farm. This farm was near Gubbins, the mansion that Robert Gaussen intended to dismantle to use the materials to enlarge his own beloved Brookmans. Fanny Ruth wished she could have seen Gubbins when it had been a home, not as it was now, an empty shell. 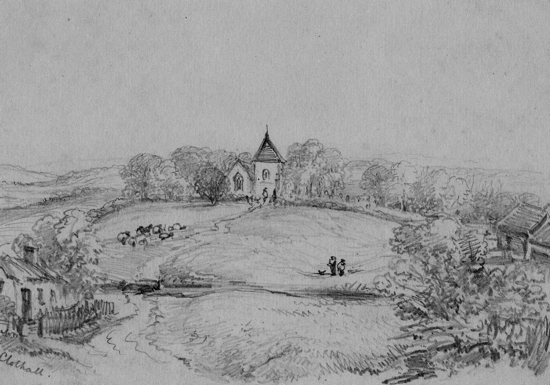 Sketching and the social round, however, played but a small part in Fanny Ruth’s life. She had the care of her husband and their three children - Fanny, born in the year following their marriage; Emily, born in 1846; and their son, James, born eighteen months later - as well as the ordering of her small establishment and all the varied duties - school, Bible class and sick visiting - of a parson’s wife. Cecilia wrote of her: "Young, pretty and attractive as she was, it would have been impossible for anyone to have made a better wife, mother and clergyman’s assistant." Ten years went by. Changes were in the air. Early in 1854 Cecilia’s husband died. In the chill November of the same year James’s father died and Fanny Ruth thought she would never forget the long, long funeral procession that slowly wound its way up from the parsonage to the church on the hill. The school that Dr. Faithfull had run so successfully was disbanded, Mrs. Faithfull and some of its .pupils were transferred to the school that her son-in-law, Charles Chittenden, had established at Hoddesdon, and it seemed that the long Faithfull connection with Hatfield had come to an end. That winter was the coldest of the century. The price of coal rose to 2/9 per hundredweight and sickness and distress were widespread. James was unhappy and his asthma was very troublesome. Little more than a year later James and Fanny Ruth were preparing to leave North Mymms. Lord Salisbury had offered the Clothall living to James and it had been accepted. During this domestic upheaval they had an unexpected visit from an interesting young man who had ridden over from Hoddesdon, where he was spending a short holiday. "I think," said James as they said farewell to their visitor and watched him canter away, "he will be the next vicar of this parish." James was right, and when at the end of what had been the hottest summer for forty years they left for Clothall, Horace Meyer came to North Mymms. Clothall, near Baldock, had an old church with a most beautiful east window and had brass memorials which, though not as elaborate, were just as old as those in the church they had just left. To Fanny Ruth’s delight the rectory was new and modern, but Clothall was a very quiet parish, too quiet for one of James’s restless, energetic nature. Babies were born and old folk died but no wedding was celebrated during the short time they spent at Clothall. In 1858 the Rev. Matthew Morris Preston died after having been vicar of Cheshunt for more than thirty years. Lord Salisbury, whose gift it was, offered the living to James. Here too were an old church and a spacious new vicarage. There were many advantages with the change, not the least being that it was near Haileybury, where their son James became a pupil, and it was also near the dear people at Hoddesdon. So to Cheshunt went James and Fanny Ruth. If only James’s health would improve! For long periods he had to confine himself to the actual preaching, leaving other parochial work to his wife and his curate. He was, however, as restlessly energetic as ever. A new church was built in the hamlet of Goffs Oak and was dedicated by the Bishop of Rochester in July 1862. James’s sister Cecilia had married again, her second husband being Francis Storr, vicar of Brenchley, Kent. Francis Storr, a son of Paul Storr, silversmith to George Ill, had been left with a family of young children, among whom was a son, Edward. In May 1868 James and Fanny Ruth travelled to Brenchley for the wedding of their younger daughter, Emily, to Edward, her aunt Cecilia’s stepson. How easy travel was in those days, thought Fanny Ruth as she and James travelled back to Cheshunt. James’s interest in education had not waned and plans were in hand for a school for girls. A subscription list was started and money was coming in so satisfactorily that it was decided to lay the foundation stone in 1871. Like a bolt from the blue came James’s announcement that he intended to exchange livings with the Rev. 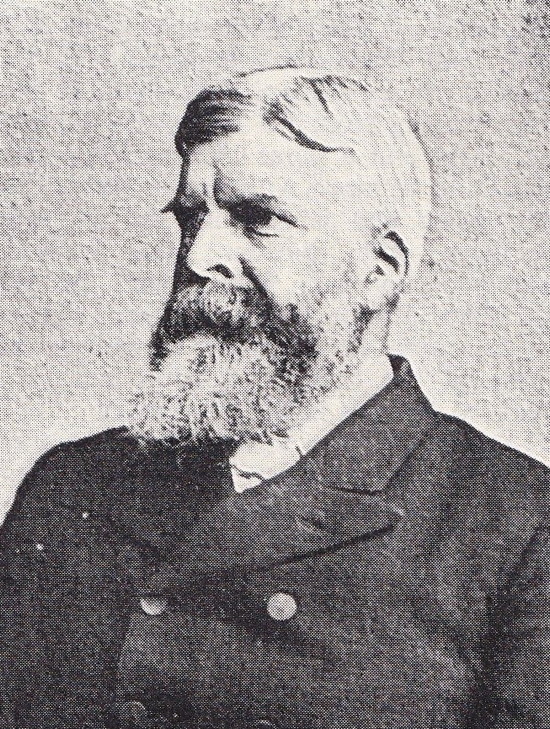 William Walter Kirby. With this move Fanny Ruth ceased to be a country parson’s wife. The lovely Wren spire of St. Dunstan’s-in-the-East rose gracefully from the smells and dirt of Billingsgate. Here was her new home. Did she at times long for the sweet fresh air of the Hertfordshire countryside? It was the fish market, nevertheless, that provided Fanny Ruth with the most colourful memory of this period of her life. To the church came the market porters for their harvest festival, bringing with them thirty-nine different sorts of fish, some big, some small, arranged in box or basket, creel or net, and all to be given to the hospital nearby. In less than two years James, only fifty-six years old,- had died and Fanny Ruth was a widow. Although her parents were now living in Leamington, having left New York because of Mr. Payson’s ill health, Fanny Ruth chose to live in Eastbourne rather than with them. The year following the death of his father, her son, who on leaving Haileybury had joined his Payson uncles in their East India trade, came home and joined her at Eastbourne. He went to Oxford, where in 1876 he took his degree, being the only first-class man in theology in his year. Handsome like his father, and with his father’s restless energy, he held livings in Brighton, Leicester and Scarborough, finally settling in London in 1895. He became the first vicar of the newly formed parish of St. Mary Magdalene, Islington. A number of alterations to the interior of the church - originally the "chapel of ease " to nearby St. Mary’s - were carried out during his time and a series of enjoyable garden meetings was a feature of his work. After three years he left for Whitechapel, where he died during the summer of 1902. Rumour has it that he was at one time offered the living here in North Mymms. "La bella Americana" died suddenly in 1877 and Mr. Payson moved to the south coast to be near Fanny Ruth. Edward Storr died the following year, leaving a young family of three daughters and a son, Vernon. Emily Storr and her children went to live in Bournemouth and, with memories of her happy childhood, named her residence North Mimms. Vernon Storr became a distinguished churchman, being archdeacon of Westminster Abbey and rector of St. Margaret’s, Westminster, at the time of his death in 1941. Offers of bishoprics could not tempt him from the abbey he loved. Fanny Ruth’s elder daughter, Fanny, married Reginald Fanshawe, professor of Greek and Latin at Bristol University. Mr. Payson died in 1884 and some time later Fanny Ruth gave tip her house in Eastbourne. She enjoyed being visited as well as being able to make visits and, accompanied by a devoted lady’s companion, she would take lodgings conveniently near members of the family or her friends, where she would spend a few weeks or months before moving on to another pleasant centre. James had been buried at Broxbourne and in the first days of January 1912 Fanny Ruth was taken to lie beside him, and there, with ancient yews nearby, the song of birds and the sound of the New River gently lapping against its banks, we leave the pretty American who is remembered today as a "wonderful old lady" who charmed all who had the privilege of meeting her. Below is a PDF of the article which appeared in Hertfordshire Countryside magazine. The article below, from the Peter Miller collection, references the Dorothy Colville scrapbooks (also Peter Miller collection) which were transcribed from the Cecilia Faithfull Memoirs, written in 1892 when Cecilia was 76, and which are in the Hatfield House Archives. Cecilia Faithfull was born in January 1816 and died in April 1896 and was one eight children of the Rev. Francis Joseph Faithfull born 1786. Her father who was ordained to the curacy of Hatfield in 1812 was sent as a boy to Merchant Taylor's School in London where he met with a severe accident being dropped out of a window by older boys and forced to go and buy butter for them. On return to school through the dimly lit streets he came into such violent contact with a post that a severe illness was the consequence. She remembers her father mentioning (I think being a small boy at Ascot races) he was picked up by George 111 and carried off to be looked at by the Queen saying "this is one of Parson Faithfull's boys, one of twelve" as such a pretty little boy. The living at Hatfield was valuable and had generally been held by some member of the patron's family but from the Marquis's of Salisbury personal attachment to her father it was presented to him. His first curate was Augustus Franks, brother to Mrs Gaussen of Brookmans. She was apparently one of their most interesting of all their friends, 'young, exceedingly pretty, very musical, clever and generally attractive'. The old Lady Salisbury said of her, "That woman is a regular witch", and I even as a child found her bewitching. Cecilia and her sister once spent 3 months in her house and had a governess provided for them and remembered it as a time of much enjoyment. "We rode or drove with her and thoroughly enjoyed her lovely garden"
Cecilia's brother James was born May 1st 1817 and received his name from Lord Cranboume who was his godfather. James was presented with the living at North Mymms which he held from 1844 - 1857. For some years James was the travelling tutor to the eldest son of Lord Salisbury who had from infancy an affliction of the eyes that produced partial blindness. His growth was checked by his inability to join in childish sports or active amusements but he was clever and well educated. They took several trips together but he died when he was 18. On James's return from one of these journeys the family gathered around James and he was asked, "are you engaged to be married Jem?" and the reply fell rather like a bomb amongst them. "Yes, I am engaged as far as I can be without my parent's consent." "A foreigner? Yes, but their fears were speedily removed by the addition of an American, one of the prettiest women I ever saw. James married Fanny Ruth Payson in Italy at 10 o'clock April 11th, 1844. Young, pretty and attractive as she was, it would have been impossible to have made a better wife, mother and clergyman's assistant in the various parishes they occupied, Fanny went on to make a number of pencil drawings of North Mymms. My sister Liliane Grantham researched our ancestry over a 25-year period and in 1999 wrote the document "Les Grantham de Deschambault". It was written in French, to correspond with our French upbringing in Quebec. I translated it to English in 2000. What follows is an abbreviated version of the document "The Grantham’s of Deschambault". The segment pertaining to their life in Canada is not included. I also wish to acknowledge Tony Bate of Auckland, New Zealand, for filling in some blanks and directing me to the Brookmans Park Newsletter. The Reverend Valentine Grantham, Doctor in Divinity, married Elizabeth Halse, daughter of Nicholas Halse and Mary Billing of Oxford, in Oxford in 1785. They had three sons and two daughters. Valentine was the Parish priest of St-Haybald, Scawby, in co. Lincolnshire, from 1798 until his death in 1829. He performed all divinity services in St-Haybald. Inside St-Haybald Church hangs commemorative marble plates of Francis and William, his twin grandsons. The career of Francis is described further down. William died at sea following a lengthy illness aboard the SS Renown, traveling from Rio de Janiero to Liverpool on December 1, 1842. Henry Grantham, our ggggrandfather and son of Valentine Henry, was a gentleman farmer and lived in Sturton in the parish of Scawby. He married twice and had many children with his first wife Elizabeth Winter, including our gggrandfather Francis Grantham. Many died during childbirth. Emma Ley, his second wife, was the daughter of Dr Hugh Ley and Elizabeth Halse, (same name and cousin of Elizabeth Halse, the wife of Henry’s father Valentine). According to his will, the family lived very comfortably and Henry fully enjoyed his duties as a gentleman farmer. He was also a collector of rare coins, fossils, minerals and books, etc. One of his passions was sheep breeding which entitled him to a few trophies, such as the silver ewer granted at the Barton Fat Stock Show Society exhibition of 1864. Until recently very little was known about Mary Carter Grantham, the daughter of Valentine Henry Grantham. Mary was given the middle name Carter as a result of three separate bequests in the will of Robert Carter Thelwall to Valentine Grantham, Mary's father. She married Reverend Francis Joseph Faithfull in Scawby on 1 December 1813. Two children, James and Cecilia Faithfull were born from that relationship. James married Frances Ruth Payson, daughter of John Larkin Payson. This couple is the subject of a previous article in the Brookmans Park Newsletter’s History section written by Dorothy Colville, in Chapter 24 entitled "The Pretty American". Cecilia Faithfull married twice. She was first married to Richard Davis. Her second husband was Francis Storr, Vicar of Brenchley, Kent. Born in Scawby, Lincolnshire on October 18, 1820, Francis, our gggrandfather and son of Henry, joined His Majesty’s service on April 26, 1839 as an ensign in the 98th Foot Regiment. On April 16, 1841, he was promoted to the rank of lieutenant and served in Northern Ireland from June to November. Following a few weeks leave in England, he boarded a ship to China with his regiment. He served during the expedition to Yangtze Kiang and took part in the capture of Ching-Kiang-Foo and the disembarkation at Nanking, which earned him the First China war 1840-42 medal. He married Elizabeth Ellen Cox at Kirk Braden, Isle of Man, on the July 24, 1844, but the young couple barely had time for each other since we can trace Francis shortly after in Hong-Kong and Chusan. He was promoted Captain on July 10, 1846, boarded a ship to Bengal with his regiment and came back to England for a few months. It appears that it is during that visit that he saw Thomas Henry, his newborn son, for the first time. His daughter Elizabeth Frances was born on July 12, 1847. Francis left England for Calcutta in December 1847 and until November of the following year, served at Dinapore, Meerut, Ambala, Lahore, and Sutley and took part in the Second Sikh War. He was awarded the Punjab Campaign of 1848-49 medal. His military records do not indicate any other visit to his family but we could assume that he returned at least one more time. In December 1849, he accompanied the regiment to Peshawar in India’s Northeast (now part of Pakistan) where he served until his death on March 15, 1851. Francis died a few days after being attacked by a gang of "fanatic Pathans" while on an outing in the company of a young lady. She managed to escape but their horses were taken and he himself was left on the ground so grievously wounded that he died shortly after. Fearing that the young lady might identify them, the assailants tried to abduct her. A sentry was placed at her residence. The political situation was such that the military authorities decided to abandon the investigation. Francis is buried in Peshawar in the British military cemetery Sadar Bazaar, grave number 938. He left his young wife, Elizabeth Ellen, and two young children, Thomas Henry, 5 years old and Elizabeth Frances, 4 years old, all living on the Isle of Man under the roof of their maternal grandfather, Lieutenant-colonel (retired) Thomas Cox. Thomas Cox, was born in Whitchurch, co. Dorset, on November 9, 1779, and baptized on March 7, 1782. He enrolled as an ensign with the Chidcock, Whitchurch and Wotton Volunteers in June 1798 and was admitted to the ranks of the 14th Madras Native Infantry in May 1803. In 1819, he entered the ranks of the Madras Native Infantry where he served until his retirement in 1838, having reached the rank of Lieutenant colonel. Thomas Cox married Elizabeth Anderson, in Alleppey, Travancore (in southwest India) on the 23rd of August 1822. She was the daughter of W. Anderson, Esquire, and of---- (mother unknown). They had one daughter, Elizabeth Ellen (wife of Francis) and three sons who served with the army in India. The oldest son, Thomas Bernard Cox died in battle at Singapore, on February 16, 1843, at the young age of 19. A commemorative plate was erected in the Fort Canning cemetery in his honor. The military record of his second son, Major John Anderson Cox shows that he was born on October 8, 1828 at Travancore and made his career in the Royal College of Surgeons starting in 1850. He served as surgeon in India and Burma and retired in London, where he died on January 6, 1907. Thomas Cox retired on the Isle of Man in north west England where he lived with his family until his death on November 23, 1851. Only a few months separate the death of Thomas Cox and Francis, his son-in-law, who had predeceased him on March 15, 1851. The census of 1851 shows his residence as Westham House, Douglas, Isle of Man with his wife Elizabeth, daughter Elizabeth Ellen, two grandchildren: Thomas Henry and Elizabeth Frances, and three maids. His will indicates that he lived very comfortably. He left a sum of approximately 12,000 pounds sterling, a significant sum in those days. It appears that Thomas Henry remained on the island for a while longer. His grandmother died there on April 28, 1866. A splendid oil portrait of Lieutenant-colonel Thomas Cox in military uniform, by an unknown artist, was brought to Canada when his grandson Thomas Henry immigrated to Canada. It is now the property of the Musée du Québec, Québec City, Canada. Our knowledge on the origin of Thomas Henry’s maternal grandmother is limited to her country of birth, India, daughter of W. Anderson, Esquire. Her father was not a member of the military, which makes research more difficult. Historians have for a long time ignored the contribution of women in society, preferring the male point of view and achievements, but this is also partly due to a lack of documentation regarding women. Fortunately, in our ancestry, some women left their trace and such is the case, among others, of Elizabeth Anderson Cox. According to her will, Elizabeth lived the remaining years of her life in a boarding home, in Douglas, Isle of Man. When she died fifteen years after the death of her husband, she left a sum of 3077 pounds sterling and 17 shillings. It was divided between her two living sons, her daughter Elizabeth Ellen (widow of Francis), her three grandchildren Thomas Henry, Elizabeth Frances and one other named William Robert Cox. One share was distributed to the people "that were close to her during the last six years". The letters that accompanied the estate documents also showed that in March 1867, Thomas Henry Grantham, his sister Elizabeth Frances and their mother lived at 19 Caprern Terrace, Plymouth in co. Devon. Elizabeth Frances inherited her share when she turned 21 years old, such were the laws at the time. She was not yet married. Thomas Henry Grantham, our ggrandfather, was born on February 22, 1846, at Douglas, Isle of Man, and was baptized on March 22 in the small Anglican Church of Onchan. He was the oldest child of Francis Grantham and Elizabeth Ellen Cox. After his father’s death, in 1851, he lived on the Isle of Man with his mother, where he received proper schooling for a young boy, probably with a tutor. In 1867, he can be traced to Plymouth and then Sidmouth, co. Devon. We have no further details on his sister Elizabeth Frances. Catherine"Kate" Buttemer, our ggrandmother and wife of Thomas Henry Grantham, was born July 15, 1847 in Surrey, England, from English parents. Three brothers preceded her. Cherished and raised in comfort, she seems to have had an easy and sheltered youth. Tutors taught Kate the basics of the English language, mathematics and history in addition to German and music. She traveled often with her family to the Lake District area for their holidays, always accompanied by a tutor. It is not known how Tom Henry and Kate met, but since the two families lived in Sidmouth, co. Devon, which was then just a village by the seaside attracting families who enjoyed good quality of life, the introductions were easily accomplished by the offering of a personal greeting card. Tom Henry and Kate were married in St. Nicholas church in Sidmouth, on July 8, 1869, in the presence of their respective families. In 1870, they lived on Sadler Street, in the heart of Wells and their rear window faced the Wells Cathedral and the Cathedral Green, an excellent view that could easily inspire a future minister of the Church. However, they were members of the St. Cuthbert parish where our grandfather was baptized. He was accepted in the College of Theology of Wells in January 1871 and was ordained curate by the Reverend Henry Philcott, Lord Bishop of Worcester on December 21, 1873. He officiated in the Holy Trinity Church of Great Malvern during his entire ministry except for a few months preceding his conversion to Catholicism, in the fall of 1875. His annual salary was 80 pounds sterling, payable quarterly. The diocese paid the expenses for his Glebe House residence. The children were born at a fairly steady pace. According to the Sidmouth Journal and Directory, we can follow the many moves of the family with the arrival of the children since each birth was announced. The four boys, including our grandfather Thomas Edgar were born either in Malvern, co. Worcester, or Wells, co. Somerset, between 1870 and 1874 while Tom Henry was studying or after he was ordained Anglican minister. The girls, except for Norah who was born in Canada, were born in Littlehampton, Sussex (Catherine); Plymouth, Devon (Gertrude); Tunbridge Wells, Kent (Monica) and Bromley, Kent (Winnifred). None of the girls married. On January 8, 1875, he was sent to Slinfold Church, in Horsham, co. Sussex. Secession to the Church of Rome "Some interest, not to say excitement, has been caused in this neighborhood by the announcement that the Rev. T.H. Grantham and his wife have joined the Church of Rome". To appreciate what attracted our ancestors to convert to the Catholic religion, one must refer to the Oxford Movement. This Movement took root around 1845 among the intellectual elite in Oxford under the influence of John Newman, eminent member of the Anglican Church and professor of theology at Oxford. His influence was such that a wave of new converts followed, including many nobles and government representatives, but also many ministers from the Anglican Church. Tom and Kate immigrated to Canada in 1884, eventually settling in Deschambault, Quebec. Our grandfather, Thomas Edgar, married three times and gave life to 18 children, 13 of them surviving to adulthood. Most of the descendants of Thomas Edgar live in the Quebec City area and use French as their first language. The great great grandson of 'The Pretty American' - a woman who lived in North Mymms more than 150 years ago - has uncovered valuable information about his family’s genealogy thanks to this site. That information will now be the main talking point of a family reunion. The ‘Pretty American’ was Frances Ruth Payson, born in Messina in January 1826, the third child of a young American couple who had gone to live in Sicily after their marriage in December 1821. She is mentioned in Chapter 24 of Dorothy Colville’s 'North Mymms Parish and People', where the romantic story is told about of how she met her future husband, Rev. James Faithfull, the tutor to Lord Cranborne, while they were on the grand European tour and passing through Messina, where her father was American consul. They came to live in North Mymms in 1844. In July 2000, the great great grandson of Frances Ruth Payson, Antony Faithfull Anderson, e-mailed our history section the following message. "I have in my possession three scrap books with drawings by Rev. James Faithfull from the Brazils, from Portugal and the Rhine and Switzerland that date from when he was tutor to Lord Cranborne. i.e. just before he met his future wife. I suspect that having once met her, his mind was no longer on the sketching! My paternal grandmother Minnie Storr was the daughter of Edward Storr and Emily Faithfull and her maternal grandfather and grandmother were Rev James Faithfull and Frances Ruth Payson. The book mentions that the widowed Frances Ruth Payson went to live in Eastbourne. According to my grandmother's account, when her father Edward Storr died, her widowed mother Emily Storr and her 4 children (Carrie, Mabel, Minnie and Vernon) went to live with Frances Ruth Payson in Lushington Road, Eastbourne. Living under the same roof for three years, in rooms above theirs, was Charles Dodgson (Lewis Caroll). My grandmother wrote: "Once having decided we were the right age he laid himself out to amuse us, and every night we went up to his rooms, which were above ours, and played with his mechanical toys and other treasures. We played with him many mathematical games, as well as ‘Doublets’." A photograph of Frances Ruth Payson with her Anderson great-grandchildren in the early 1900s shows that she was still beautiful in old age. I get the impression from the photo that she really enjoyed her great-grandchildren. My grandmother kept up with Payson cousins in America until well after WWII. When my father was taken a prisoner near Dunkirk in 1940, the American cousins were wonderful in the way in which they sent food parcels to him in Germany. Moreover, they helped find "American Godmothers" willing to adopt other POWs who did not have the good fortune to have American relatives. I shall be printing off a copy of the Chapter from Dorothy Colville's book to take with me to a family reunion this coming Sunday, where I am sure it will be read with great interest. What a good idea to put the text of the book on the Internet!" Online editor's note: Below is the second of two related pieces from our history archive. Another direct descendent of 'The Pretty American', mentioned in the history pages of this site, has traced his family history across the Atlantic to North Mymms. Two and a half years ago the great great grandson of Frances Ruth Payson, a woman who lived in North Mymms more than 150 years ago, was able to uncovered valuable information about his family’s genealogy thanks to this site. Chapter 24 of Dorothy Colville’s book, 'North Mymms Parish and People', reproduced in full on this site, tells the story of 'The Pretty American'. Antony Faithfull Anderson's research about his past was written up for this site in July 2000 (see above). Two and a half years later, another relative has found his way to the same information about 'The Pretty American' in our history archive - this time via New Zealand. While researching his genealogy, Mark Grantham, from Quebec in Canada, was in e-mail contact with a man in Auckland. Tony Bates was able to help Mark fill in some blanks, but also directed him to the former Brookmans Park Newsletter - the forerunner to this site. When Mark clicked visited the site he found the article about his distant relative. It encouraged him to write a feature linking that find to other information he has uncovered during his research into his family history. What Mark didn’t spot at the time, was the similar story told two and a half years earlier, when the great great grandson of Frances Ruth Payson,‘The Pretty American’, also wrote to the site. Now the two men have the opportunity of filling in some more gaps as they try to piece together their family tree.